What inspires me as an artist – I’ve been painting non-stop since a deathbed conversation I had with my mother.”Don’t wait,” she said. What inspired me for this specific image was that some day soon, silicon “cashiers” will indeed dream of Big Macs. Perhaps it is all they will dream of. A word from our editors. Lawyers and Cyberspace: Seeing the Elephant? This paper considers the problem of Internet regulation, and how it has been exacerbated by poor theoretical models for cyberspace. Furthermore, it considers how the conceptual difficulties with regard to the nature of cyberspace have been replicated in formulation of regulation. Having identified the key areas of difficulty, this paper then explores a potential solution building on the regulatory work of Chris Reed and Christopher Marsden. 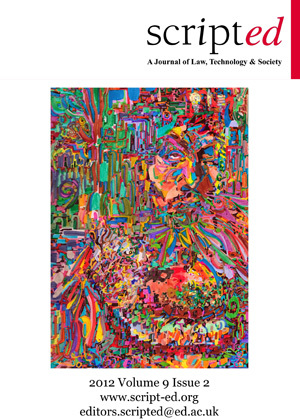 Using autopoietic theory to fuse their understanding of both the human, and technological aspects of Internet regulation, this paper aims to generate one coherent theory that would offer a flexible, responsive and effective regulatory model for cyberspace. This paper focuses on the Internet policies of the People’s Republic of China (PRC). It discusses the ways the governing Communist Party of the PRC manipulates factors that regulate behaviour online to an extent that actually enables it to control the flows and content of information and subsequently, also, the politicisation of the Internet community. Consequently, such practices enable the ruling regime to maintain the status quo, allowing only minor, localised modifications to its policies and avoiding major political and ideological ruptures. The essay discusses the Internet conditions in China through the prism of Prof. Lawrence Lessig’s theory, adopting the same quadripartite system for analysing regulatory factors in relation to cyberspace behaviours. The analysis further demonstrates how the ruling party is realising Lessig’s fears in relation to the four identified categories of regulatory modalities and also how the government even adopts additional measures in order to preserve and extend its control through implicit, as well as aggressive tactics. The ultimate goal of this paper is to demonstrate how China might be formulating its own model of Internet governance and how this model might be gaining more power, becoming capable of eliminating, controlling or co-opting any serious challenges to it from internal and external influences. Three centuries have passed since copyright law was developed to stimulate creativity and promote learning. The fundamental principles still apply, despite radical developments in the technology of production and distribution of cultural material. In particular the last decades’ developments and adoption of ICTs have drastically lowered barriers, which previously prevented entry into the production and distribution side of the cultural marketplace, and led to a widening of the base at which cultural production occurs and is disseminated. Additionally, digitalisation has made it economically and technically feasible for users to appropriate and manipulate earlier works as method of production. The renegotiation of barriers and the increasing number of creators who publish their works has led to an increase in copyright violations and a pressure on copyright legislation. Many of these potential violations are tolerated, in some cases have become common practice, and created social norms. Others have not been so fortunate and the law has been rigidly enforced. This arbitrary application decreases the predictability of law and creates a situation where creation relies on the tolerance of the other copyright holders. This article analyses different cases of reuse that test the boundaries of copyright. Some of these are tolerated, others not. When regulation fails to capture the rich variation of creative reuse, it becomes difficult to predict which works will be tolerated. The analysis suggests that as copyright becomes prohibitive, social norms, power and the values of the copyright holder dominate and not law. The mere acquisition of a patent does not guarantee success in a claim of patent infringement. The patent claim terms of a patent claim play a crucial role in patent enforcement or litigation, since they are the primary determinant of the scope of the patent right. study quantitatively analyses patent claims involved in patent infringement lawsuits in Japan. On the whole, patent claims which have fewer terms functioning as limitations on the patent claims are advantageous in patent infringement lawsuits. Moreover, among patent claims that have more terms functioning as limitations of the patent claims, those which have more words specifying the relationships between the terms are more likely to be successful in lawsuits. There is an intensive discussion about the incorporation of intellectual property (IP) terms in Free Trade Agreements (FTAs). Some legal scholars suggest that IP terms constitute the price that developing countries have to pay in order to obtain FTA commercial benefits. Thus, it is assumed that economic achievement is the principal motivation for developing countries, while the legal impact of new intellectual property standards is sometimes not immediately obvious. It is in this context that developing countries have been recommended to pay attention to the implementation of the FTAs, assuring that IP terms are compatible with domestic interests. The purpose of this work is to check if developing countries have responded to this concern. Thus, this work will check if Chilean national authorities were aware of the critiques that affect the FTA established with the United States of America and it will see if these critiques were addressed and mitigated by their legislative work. This analysis will be based in the following critical terms: (1) The protection of undisclosed information; (2) Limitations on liability for Internet Service Providers (ISPs). This paper briefly discusses the recent Football DataCo v Yahoo! C-604/10 decision by the Court of Justice for the European Union on the interpretation of Database Directive 96/9EC which concerns the harmonised copyright scheme for original information collections provided by the Directive.